Alicia: RA Course Pearl GERD – The Pearl that Chandra mentioned, one that I had worked on was GERD, and I like to think of them as little pearls of wisdom. Let me just show you an overview of what it looks like. We don’t have to go into depth with it; I don’t need to read it. We’ll just give you a scan, a little clip here, and then we can wrap up. Boyd: This is an example of something that’s in the course. Alicia: Right. In the Pearls, there’s going to be like 20-plus Pearls right now, they’ll be expanded. Anything that risk adjusts, that’s a chronic condition, we intend to have a Pearl or a tool for you to go to. This particular one was under GERD, but it also covers esophagitis, Barrett’s esophagus. It gives you the definition of GERD, esophageal reflux. You also get – I’m really into pictures, I’m a visual learner – we put that in there with the description. Chandra: If you’re squeamish, you might want to look away for a few minutes while she scrolls. Alicia: These aren’t bad in my opinion, but… The disease process and stuff, we also let you know what are the symptoms that you’re going to be reading about when you are doing the risk adjustment? You got to be able to draw lines. Differential diagnosis – Barrett’s esophagus, when the stomach lining is changing the cell structure and going up into the esophagus, little things like that that will make you a better coder. There’s also some other types of esophagitis complications. Similar diagnoses that may risk adjust – again, the anatomy, you got to know the anatomy of the whole digestive tract to really understand even something like GERD. The medications – common medications that are used for each of these – histamine blockers, proton pump inhibitors. Not only telling you what they are, but what they do. ICD-10 guidelines that are around this particular diagnosis or these diagnoses, we give you ICD-9 and ICD-10. Chandra made these great graphs, she’s so good at these, that really helps you get through the guidelines and narrow down quickly. Then, down here at the bottom also, she has added through the 9, but also Coding Clinic References that may be applicable for you to know something that changes, a nuance, in a case. Again, that is, I think we said about 8 pages of information that will really make these chronic conditions pop for you. You don’t have to have this stuff memorized because you can always reference it, but if you go through and you read these, it will make you a better diagnosis coder with these chronic conditions. Again, when you’re doing risk adjustment, you have to be able to draw a line. They can’t just say the patient has GERD, you have to be able to show that it’s current and that it’s being treated, and that could be a medication or him addressing the signs and the symptoms, and so on. That’s a brief overview of what one of our Pearls look like. Again, we have 20-plus in the course and it will continue to grow just constantly. We’re constantly adding content. Chandra: Can I add real quick, we got a lot of questions about: “Do I really need to know ICD-9 for risk adjustment?” Risk adjustment is based on a retrospective review forecasting for next year; so yes, the carriers are all collecting data from 2015 right now to justify their 2016 payment. Remember, we didn’t go to ICD-10 until October; so the first nine months of last year were all based on ICD-9 data. 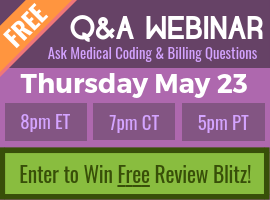 Most risk adjustment plans are still doing ICD-9 coding and review and require that their coders use and understand ICD-9 as well as ICD-10.